05 Feb Minor movements for wool. 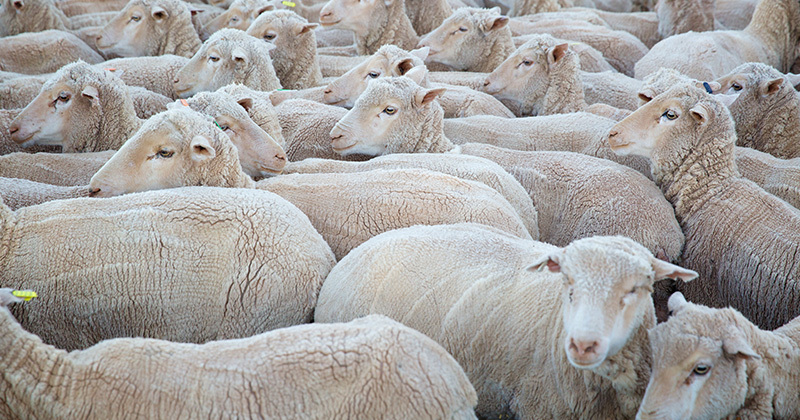 The general overview of this week’s wool market was that sellers saw minimal movements. In fact, if markets were stronger on day one they gave the gains back the next day, and vice versa if markets started softer. 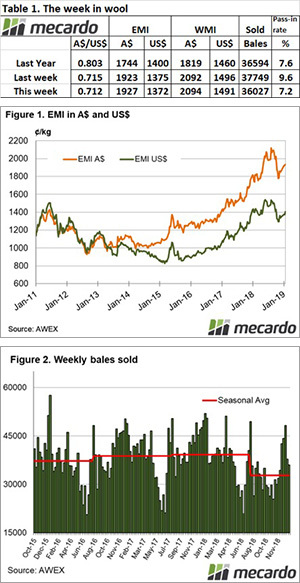 Buyers began keenly but again there is evidence of wariness at these price levels, while wool growers are happy to continue to sell with a modest pass-in rate this week. The Eastern Market Indicator (EMI) increased 7 cents on the week, ending at 1,934 cents. The Au$ compared to the last week was stronger at 0.712 US cents. That lifted the EMI in US$ terms to 1,405 cents, a strong rise of 32 cents (Table 1). Fremantle had a smooth week of sales, with some small gains in finer MPG’s. The Western Market Indicator (WMI) rose 2 cents on the week to finish at 2,094 cents. This week saw a supply drop on levels from the last few sales, with just 38,830 bales on offer. Growers passed in 7.2% of bales offered, resulting in a clearance to the trade of 36,027 bales. The season to date has seen 952,848 bales offered which is down 15.7% bales few than the same period in the 17/18 season. The dollar value for the week was $73.63 million, for a combined value of $1.9 billion so far this season. The total wool offering over all micron ranges is showing a mixed bag. Any MPG categories broader than 18.5 have presented lower volumes season on season, with the 21 MPG as an example 44% down on last year. On the other hand, finer than 18.5 MPG volume is up all the way to the superfine types. 18 MPG is up by 17% while the 15 MPG is 13.5% on a season to date comparison. Crossbreds, while limited in offering, were keenly sought this week; it was a strong performance with the 28MPG gaining circa 90 cents in both Sydney & Melbourne. The cardings indicator fell again in all centres with reports of 20 to 25 cent falls in the East, while the West was largely unchanged. Next week the offering isn’t set to reach too far from this week’s level, with 40,426 bales rostered across the three selling centres. Sydney will be holding it’s designated Superfine Sale. Looking further ahead, a big drop is on the roster. Week 33 of the selling season is currently set for just 30,981 bales, with 30,000 to follow.